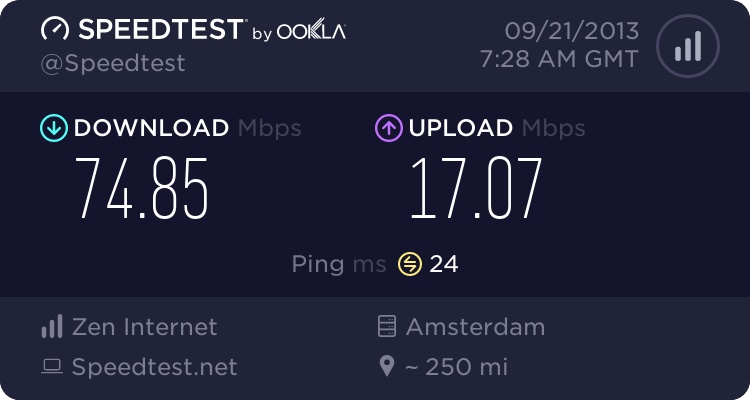 I'm getting massive ping spikes when the Wireless Sky anytime box is plugged in, even if isn't downloading anything, anyone else having the same problem or any advice. The following graph shows the difference between the sky wireless box off/on, see if you can tell when it was turned back on! The problem with this graph is that you appear to have turned the Sky box back on at around 3pm on a Saturday, when there might also be increased load on the Virgin system as other users start streaming video and using the Internet. Your test would be better repeated in a quiet period, such as in the early hours of the morning. My suspicion is that you're on a relatively slow Virgin product and the Sky box may be downloading material in the background that it believes you might want to watch. This may mean the Sky box is saturating your line. However, your evidence is not yet conclusive that the Sky box is to blame (only a single data point, and you turned the Sky box on at what might be a busy time) and I'm not a Sky user, so am not clued up on the behaviour of the device you have. Thanks for the reply, I'm on the 30MB package from Virgin, so it shouldn't be that slow. The Sky box should download programs only on demand and not fill a partition of the disk up from the satellite signal as the old Sky+ boxes used to. I will unplug the sky wireless receiver now and post a live graph so you can see the difference.